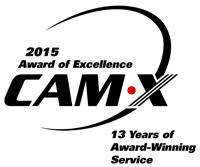 Central Communications of Welland, ON has been honoured with the exclusive 2015 CAM-X Award of Excellence for the 13th consecutive year. The Award is presented annually by the Canadian Call Management Association (CAM-X), the industry’s Trade Association for providers of call centre services including telephone answering and message delivery. Central Communications was presented with the Award recently at the CAM-X 51st Annual Convention and Trade Show held at the Hilton Doubletree in Charleston, SC. Now a thirteen-time winner, Central Communications earned the Diamond Plus Award for thirteen consecutive years. CAM-X extends its congratulations to the staff of Central Communications on their proven quality service to their customers.